The lady seated next to me in the gate area was very chatty. My head and heart were tired, but I prayed, "Lord, help me here." That's one of my simpler prayers. God knows what I mean. In this case, it meant, "Help me to pay attention to this soul, even though I feel like sitting here zoned out watching planes take off and land..."
The lady looked to be in her 70s, so that soon reminded of the days when I used to travel with my Mom. It also "tenderized" my selfish heart, because while at first I just wanted to sit and be quiet, I began to wonder if this lady was nervous about traveling alone. My suspicion was confirmed when she told me this: "I haven't flown in 20 years, so all of this is very new to me. My daughter is staying in constant contact with me by phone." This elderly traveler was clutching a very old "flip phone," and it rang shortly afterwards. "Yes, I'm at my gate. A nice man brought me in a wheelchair and he even gave me ice water to drink. I'll be fine, and I'll see you all soon." She pressed the red button to disconnect the call, and then showed me her phone. "How can I tell if I have enough battery power? My daughter told me to plug in my phone if my battery was low." We looked at her phone (which was probably one of the first flip phones made) and it showed a full-battery icon on the screen. "You'll be fine for the rest of the day," I assured her. "Is Minnesota your home?" she asked. "Yes," I said. "And you?" "I'm flying to my Dad's funeral. He was 91." 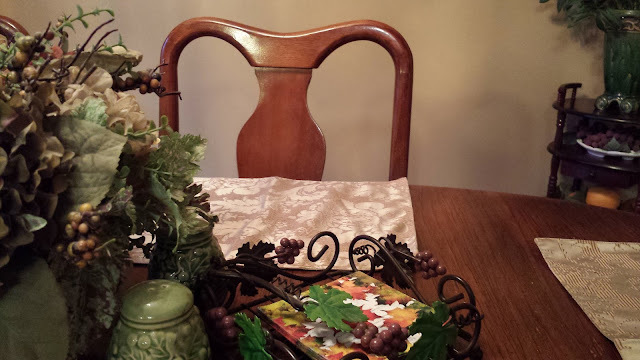 And they will have an empty chair this Christmas. 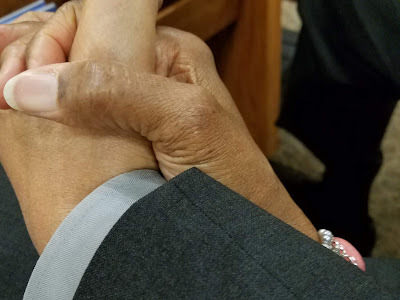 As one who spent my first Christmas without our Mom just last year, I was immediately filled with the compassion that comes from having suffered a similar loss. Grief puts people in a "club" that they never would have joined voluntarily. After listening to stories about her Dad, many of which reminded me of my own childhood, I offered my condolences. 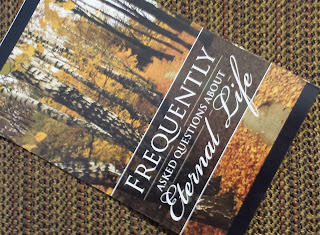 As she was getting ready to leave, I gave her the tract, "Questions About Eternal Life." I carry them with me, along with several others. 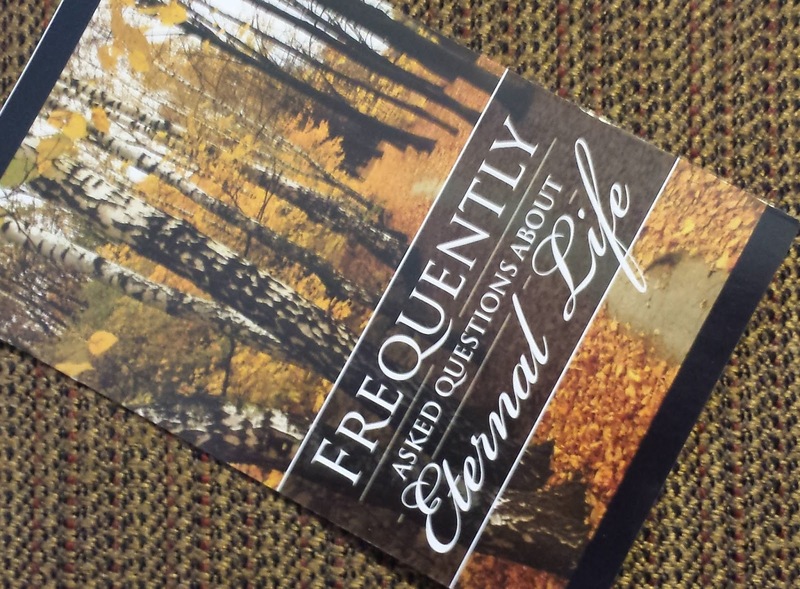 "This has some Bible verses that I am sure you will find very comforting," I told her. She took the tract, looked at the front and back, then carefully tucked it into her purse. "Thank you so much. I am going to need this." She had tears in her eyes as we parted ways. I believe that by now, she has read that tract filled with Scriptures on salvation and eternal life. I wonder how many people are flying "home" for funerals at the same time that others are flying home for comfort and joy? Countless numbers of people are celebrating Christmas with someone missing. Did you have a loved one pass away this calendar year? You're not alone. 2. If it feels like you've been knocked over by a wave of sorrow, let someone know. Allowing others to help us through the tough spots is like being thrown a "life preserver" from Heaven. Don't shut people out; pull them closer. "A friend loveth at all times, and a brother is born for adversity." (Proverbs 17:17) Friends don't automatically know when we need them. Sometimes, we just have to call. 3. Keep family traditions alive. 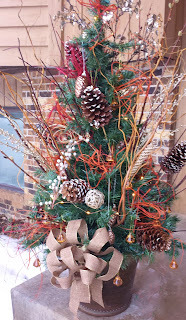 Mom loved to have me invite my sister friends over to her house to help decorate her tree. She was unable to do it herself after a certain point in her illness, so we did it as a group and turned it into a party. 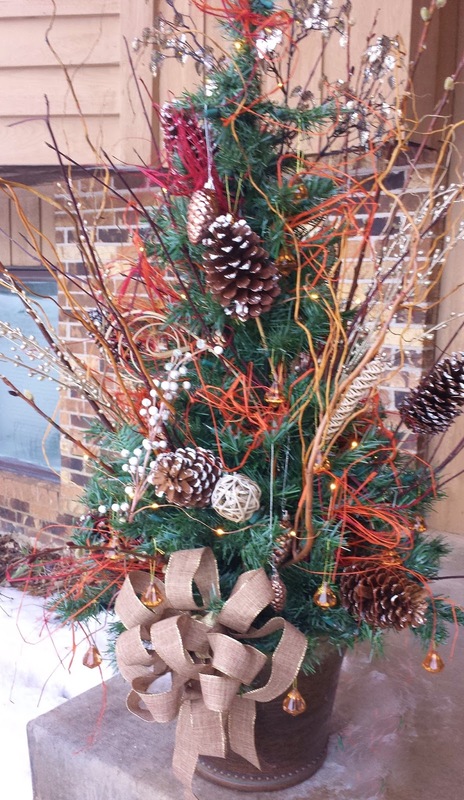 Her little tree is on my front step now, decked out in honor of our Mom. "A merry heart doeth good like a medicine: but a broken spirit drieth the bones." (Proverbs 17:22) Traditions make the heart merry. Is recovering from grief as easy as 1-2-3? Not at all. Grief is one of the most complicated human experiences that we will ever have, but God knows more about this than we do, so He is able to carry us through our dark days until the sun breaks through again. On a recent evening after church, my husband Norman and I were looking at airfares to Los Angeles, planning a trip for him to go and visit his oldest sister. We knew that she was doing poorly after having had a recent accident. "Why don't you fly out in January instead of February?" I suggested. Two hours later, on December 11, 2016, we received a call informing us that my sister-in-love, my husband's sister Dolores had passed away. Life is a vapor. Scripture tells us that. The truth is that none of us knows how many days of "vapor" we will have, so now is the time to cherish our loved ones. Right now. Do you have an empty chair at your table this Christmas? Invite someone to fill it.